Photo courtesy Iron Horse Brewery. Beer from the Pacific Northwest has a certain reputation, and that reputation involves hops. The plants are grown in droves in Oregon's Willamette Valley and Washington's Yakima Valley, their flowers used copiously in ales brewed across the entire region. There's not just one fresh-hop beer festival, but several across the whole of the state. IPA is king, and the streets of downtown Bend are littered with hopheads of all ages, races and genders. That's the conventional wisdom, but of course, it's far from the whole picture. Deschutes Brewery's flagship offering, after all, is Black Butte Porter, still a top seller from coast to coast. And up north, a much smaller beer outfit has quietly taken over the state of Washington with a dark ale of its own—one that defies easy description. Quilter's Irish Death is the product of Iron Horse Brewery, a down-home pub and production facility in the Central Washington town of Ellensburg. Its unusual name comes from its original creator, Jim Quilter, who first opened Iron Horse in 2004. Quilter, who passed away in 2009, got his start working for Sierra Nevada in California before coming to Ellensburg, but quickly found that he liked brewing more than running a business and sold it two years later to the father-and-son team of Greg and Gary Parker. They remain small as the ninth-largest brewery in Washington, but such is the success of their flagship that it has become the top-selling beer in bottles and kegs within the state. This success comes despite the fact that Irish Death is pretty difficult to classify. The bottle simply calls it a "dark smooth ale," which—considering there's little of the heavy flavor that defines a stout or porter—is about the best description possible. It's definitely overloaded with malts. Greg Parker describes its recipe as using the "everything but the kitchen sink" approach—and only a little hop flavor, serving as the framework that keeps everything else in check. 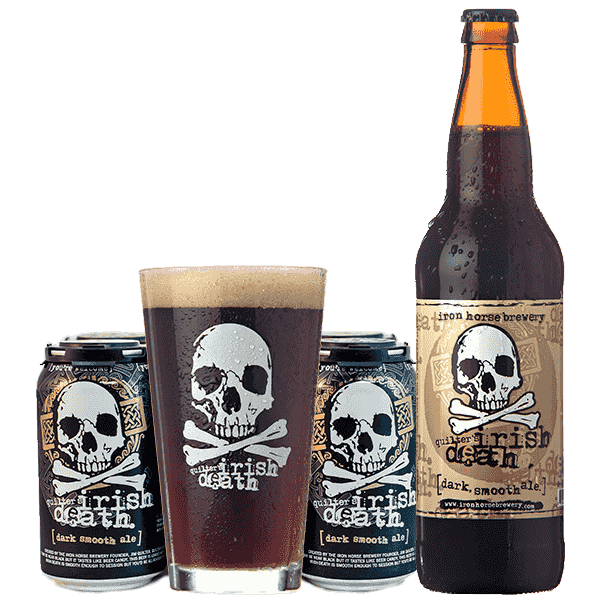 Like some of Deschutes' or Boneyard's better-crafted IPAs, however, Irish Death is dangerously drinkable. Smooth and dark are definitely the watchwords here, and it's easy to relax with a couple over good friends before the 7.8 percent ABV starts kicking in. The beer's easily found over on the other side of the Columbia, from Vancouver to White Salmon, and anyone looking for something new this winter needs to give it a try. "Forget style guidelines," as Parker advises on the Iron Horse website. "Is your pursuit of micro beer about tasting copies of a style that fits guidelines or about finding s—- that tastes good?"